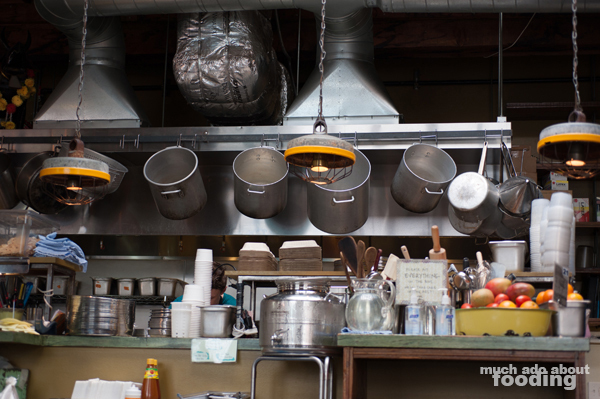 On our first trip to Portland, our calendar was overflowing with so many restaurants to try that we weren't sure where we would find space to store it all. 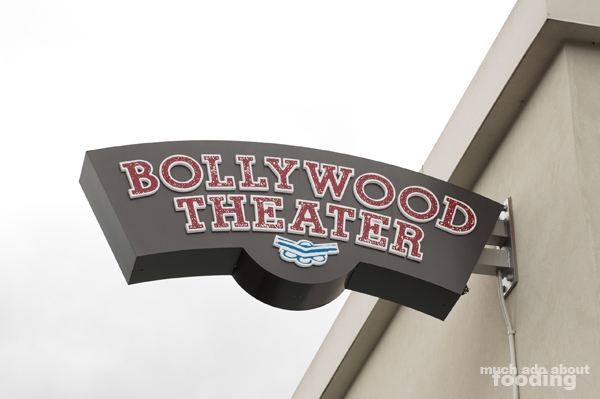 However, plans do change around a bit so we happened to go to Bollywood Theater first for our initial exposure to food in Portland. 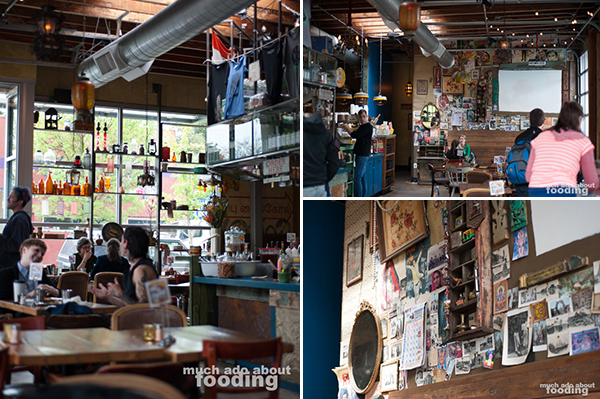 This popular restaurant surely spoiled us and set the bar high for all remaining meals. 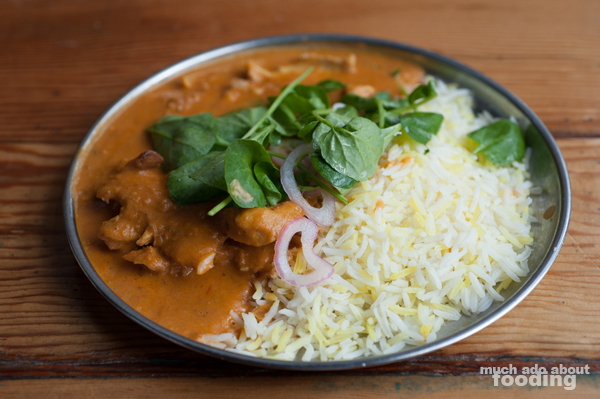 We weren't sure what to expect other than having seen that it specialized in Indian street food. I guess I had a concept in my mind that it would be a hole-in-the-wall place but once we opened the door to look inside, it certainly was not that at all or at least, not in the stereotypical way. 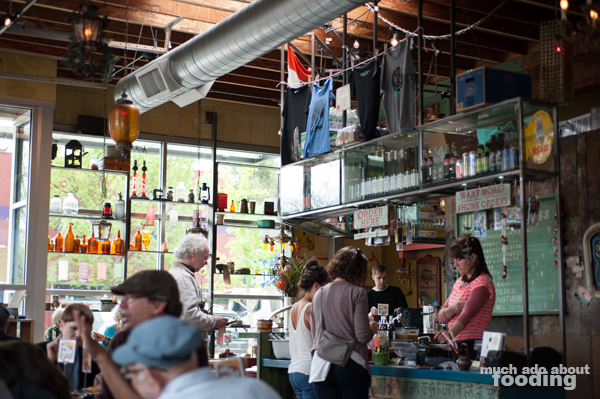 I'd have to say that the place affirmed in our minds the fact that Portland is an eclectic and arts-driven type of town. To be honest, my first surprise here was that it was not run by older Indian employees and chefs; hearing that they were known for their street food style painted a picture in my head of seasoned veterans of the cuisine who perhaps had immigrated to the area from India itself. However, it was not that at all but rather a restaurant that seemed built up as an homage to the culture. Knickknacks lined shelves and the walls were papered with old Bollywood film posters. It gave the space a flair like no other. There was also a projector screen permanently placed on the back wall which showed old Bollywood films (without audio though). We looked at the menu and saw sections titled "Street Food, Small Plates, Thali Meals, and Vegetables and Sides" so figured we ought to have a little bit from each part. Since it was our first exposure to a restaurant in Portland, it was also our first experience with the common restaurant practice of having signs and prominent directions to inform guests to bus their own tables. There was also water to be gotten only if you wanted some. 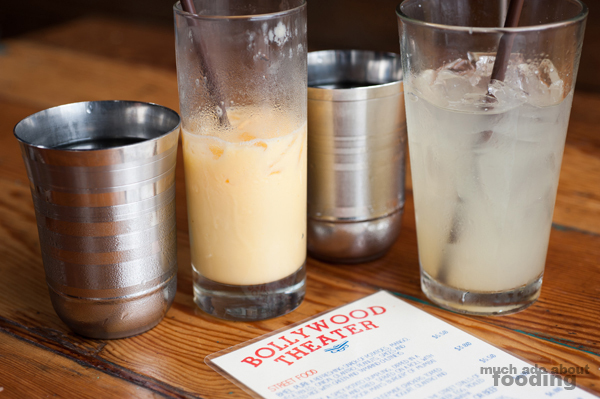 We did have our cups but also ordered drinks from the menu which came at less than $3 each - the Ginger-Lime Soda and Mango Lassi. What a refresher that soda was! 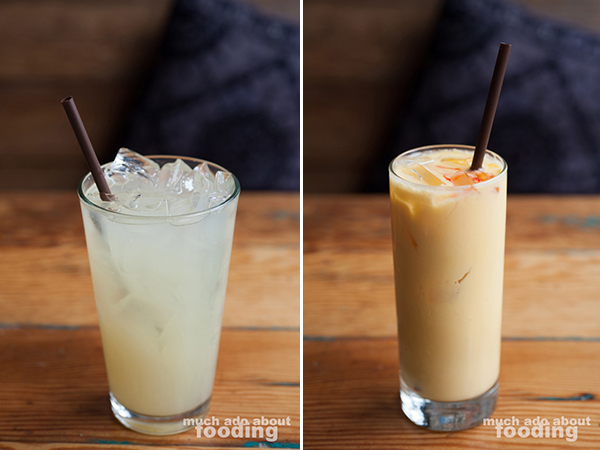 The lassi was also smooth and creamy, sweet by design and mango. I don't always get great lassis when I go out but Bollywood Theater knows what it's doing. If we come back to the area, I'll have to try out their Sweet Lassi and Salty Lassi options too. With the variety of street food available to choose from, I felt nearly ashamed to order simple, more commonly known dishes but I always like to see how the simplest dishes are prepared and what they taste like. 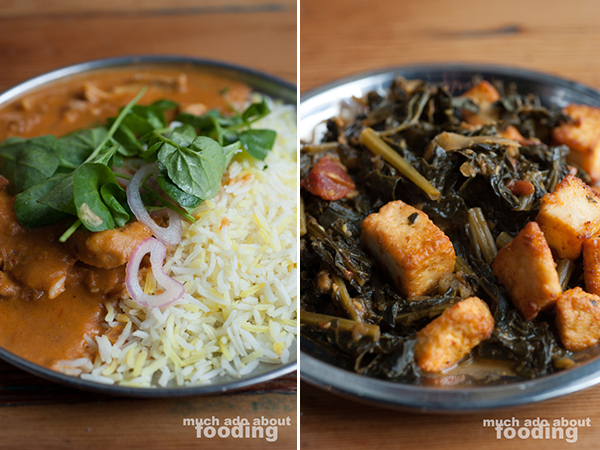 We chose the Chicken Curry ($8 - creamy curry with saffron rice) and Saag Paneer ($7.50 - braised kale, spices, cream, and housemade paneer) for a side. The chicken curry was so flavorful and fragrant with its saffron rice that I nearly finished it all before Duc could get a bite. 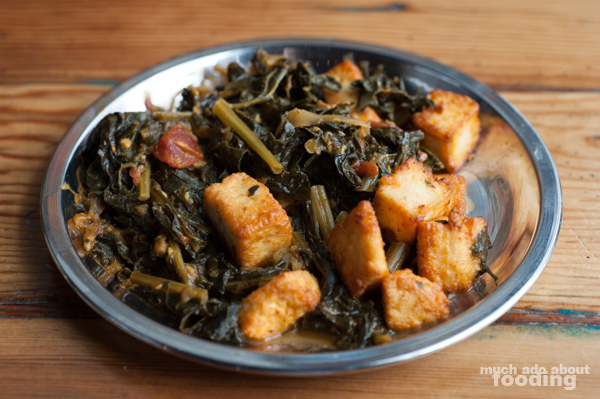 The saag paneer was a change of pace with kale used instead of spinach but it ended up actually adjusting the traditional dish for the better. The kale held up more strongly to the braising with a distinguishable shape whereas a lot of times, spinach is overcooked, wilted, and a mush. I also liked that their paneer was housemade; the extra touch makes all the difference in food. 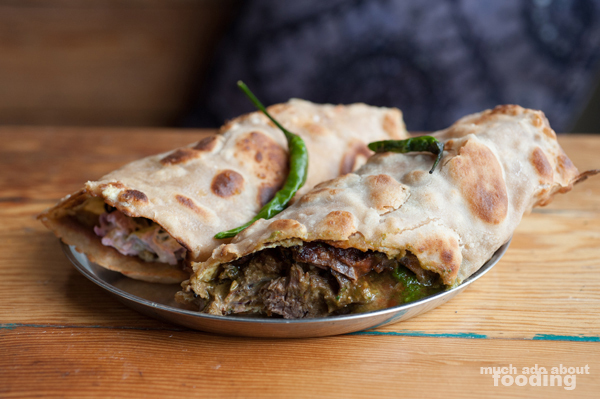 We lastly tackled the enormous Kati Roll - Beef ($8 - can be meat or paneer, egg, pickled onion, and green chutney rolled in paratha) which is traditionally found in street stalls of Kolkata, according to the product description. This could be a meal in itself with its overflowing components. 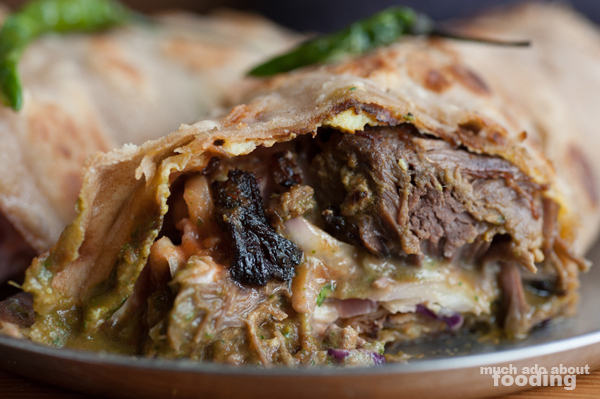 The paratha gave it a strong crust to keep everything all together, and we really enjoyed the dish for its abundance and quality. All in all, Bollywood Theater certainly has the atmosphere for somewhere to hang out with great, inexpensive food and be distracted by the art. We both recommend you dropping in one day to eat!